Today we’re talking about budgets! YAY right? I mean, who doesn’t love to budget? Yes, feel free to roll your eyes. I’m right there with you. One of hardest things to do when you’re thinking of hosting a fundraising event is to figure out the money. The truth is most of us hate sitting down and making a budget for our events. At best it’s kinda boring. At worst it’s panic-inducing. Sign me up, right? Just like in our personal lives, you have to know how much you can comfortably spend on something before you go out on a shopping rager. Unless you want to be crying into your credit card bill next month. The same goes for planning events. Often times we don’t want to know where we truly are when it comes to money because it brings up so many other negative emotions for us. So instead we try to stick our heads in the sand. I get why people do. It can be overwhelming. It’s not just deciding on how much money you want to raise (which can be challenging on it’s own), but you also have to figure out what kind of event you can afford to have. 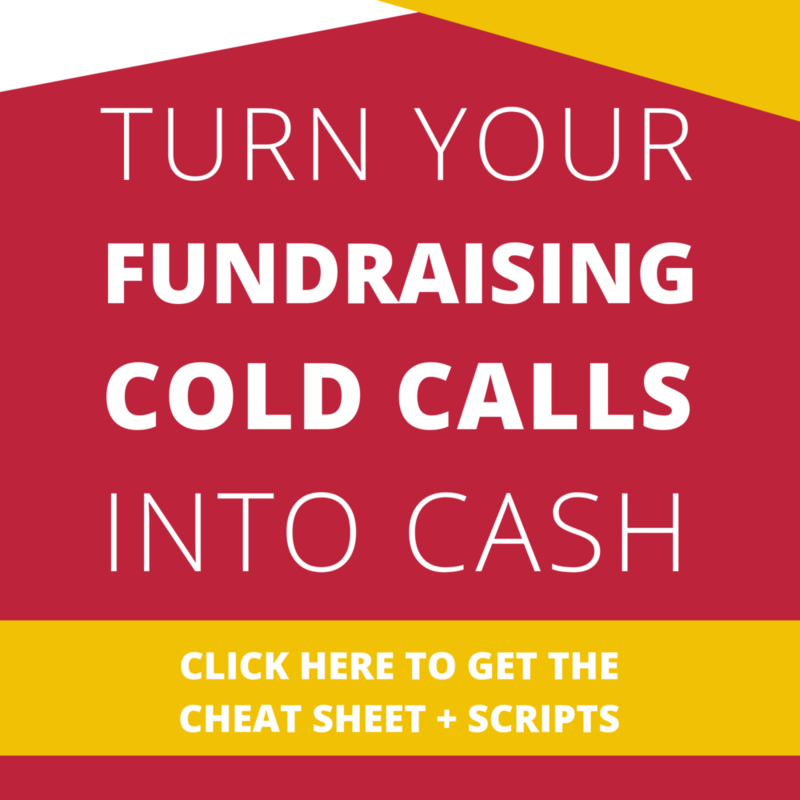 There are so many fundraising myths out there, like thinking you can just wake up one day and plan a fundraiser for free. As much as I’d like to see money fall out of the sky and into the bank account supporting your cause, it just doesn’t work that way my friend. Fundraisers always require an investment of resources- time, money, or people power. Sometimes people don’t realize that even if you can plan an event that’s “free”, there are still upfront costs. Usually an event is considered “free” when you’ve spent money first and then make back your investment through ticket sales or sponsorships. So there are a few things you need to do to create your event budget and set yourself up for fundraising success. 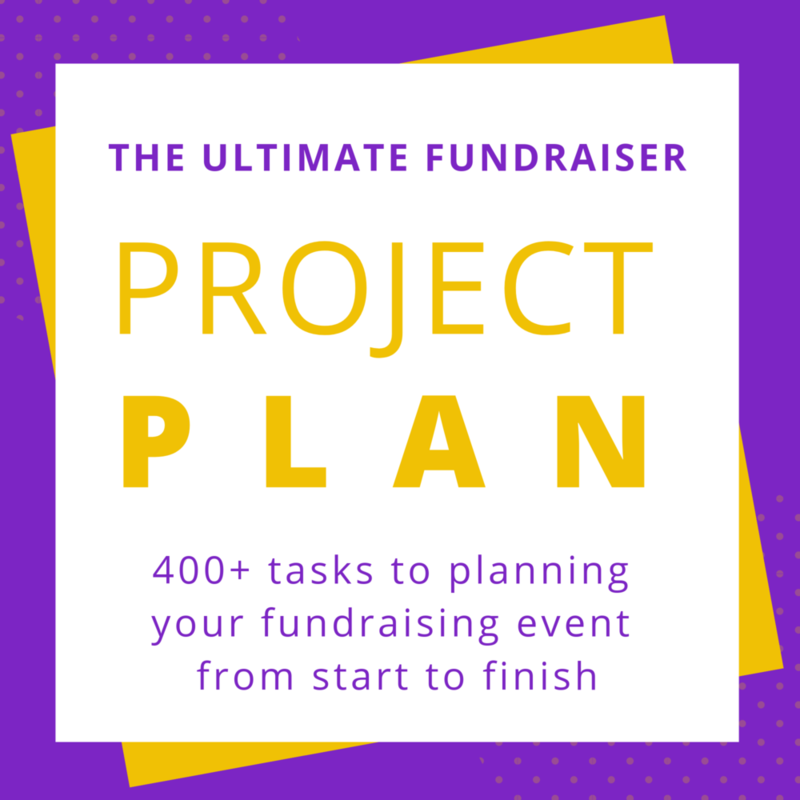 Before you dive head first into planning your fundraiser, you want to get really clear on why you want to do it in the first place. 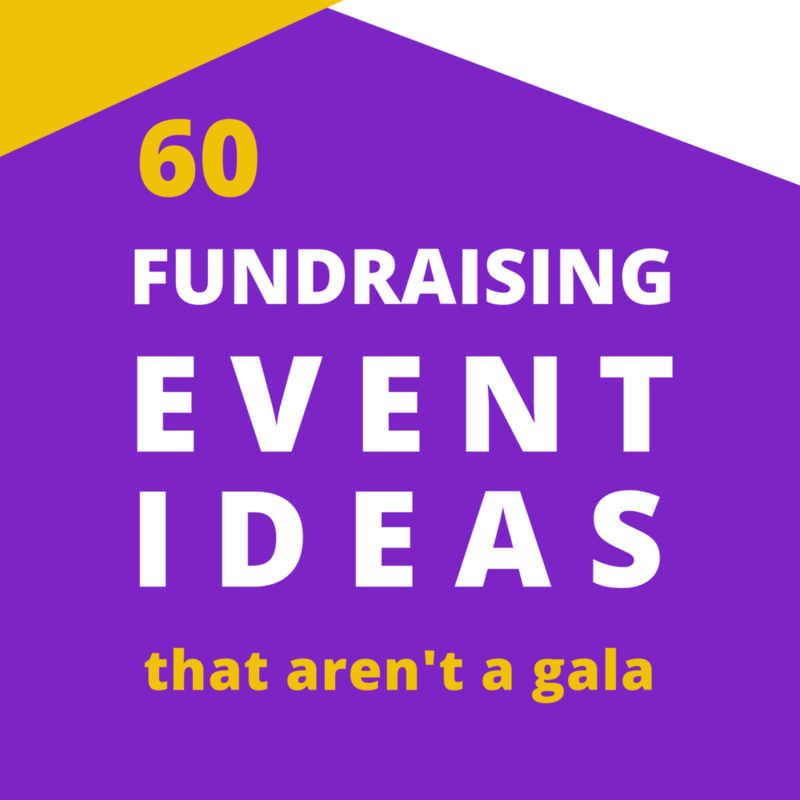 It might surprise you, but I like to challenge people to first ask themselves if an event is really what they want, or could they raise the funds they want to in a different way. 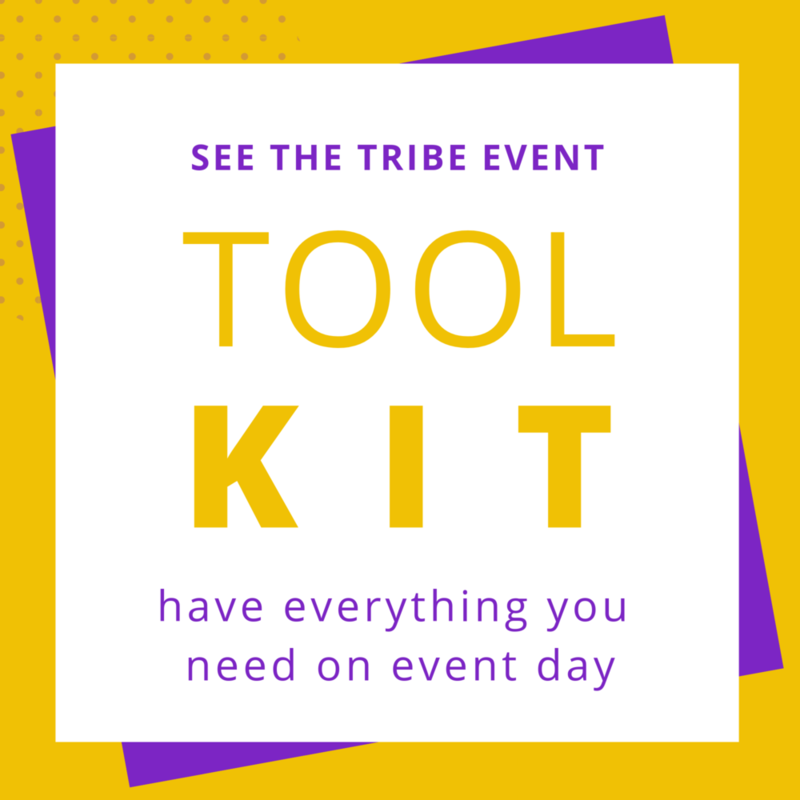 Events are a lot of work so you want to make sure that you’ve really thought through your options instead of just assuming you have to have an event (or a certain type of event) just because everyone else has one. What are you trying to raise money for? Do you have a specific program or project that you’re trying to get off the ground? What will the funds help you accomplish? This might seem pretty obvious, but you’d be surprised how many people try to have an event but don’t get clear on what they’re going to use the money for. Spoiler Alert: “We just need money” isn’t a good enough reason. Because the people you invite to your event, as potential donors, will want to know what their money is going to specifically. People donate to causes because they’re looking to make a difference, and you have to be able to show them how supporting you helps them make that happen. People support causes year after year because the nonprofit or charity has proven to them that they can be trusted to use their resources to make actual (visible and measurable) impact. So before you start really planning an event, think about what opportunity you’re going to give people to make a difference in their community. Now the fun part- setting your fundraising goal. This is the time to dream. Come up with a number that excites you and take the time to visualize all of the amazing things you’ll be able to do with that amount of money. Money is currency, and currency is energy (sound woo-wooey? I know. Bear with me). Money only matters because of what you can do with it. So get clear and get excited about what you want to accomplish. Have you given much thought to what type of event you want to host? What do you think your tribe would like to attend? What do you think they’d like to see or learn about you? Being creative and keeping an open mind when brainstorming ideas for your event helps you make sure that you’re using your invested resources wisely. Don’t just have a gala because everyone else is. A gala might be not only out of your price range, but also not what your guests really want. Need some ideas? Here are 20 cool events. Take some time to find options that work for your brand, your supporters, and your bottom line. 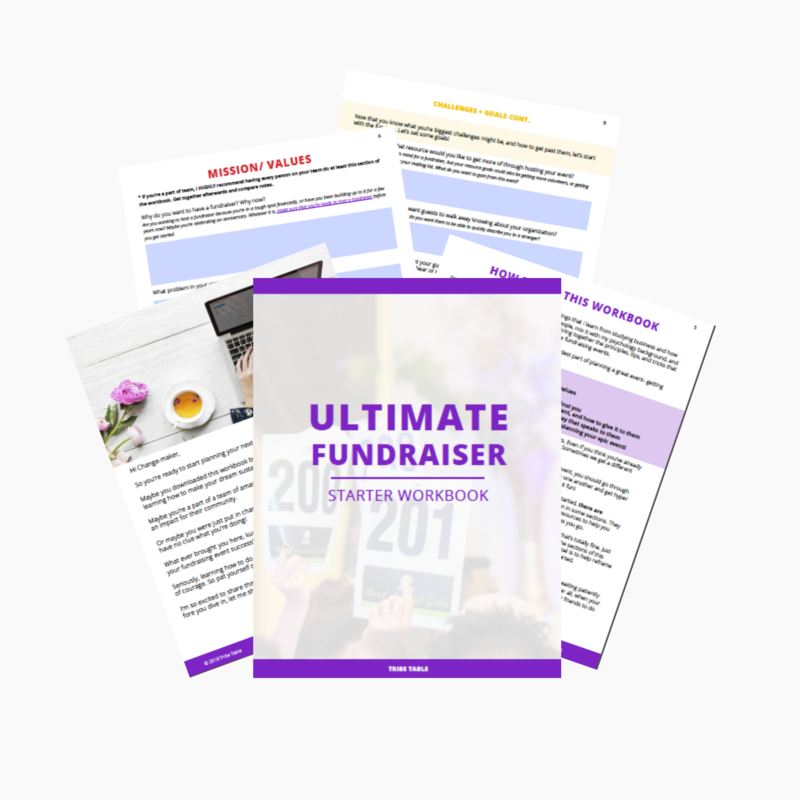 Check out the Ultimate Fundraiser Starter Workbook which walks you through it. So many people get it in their head that a fundraising event will be the thing that saves their cause financially, so they decide that they’re going to have one. No matter what. This is the fastest way to lose a ton of money and end up exhausted and in the hole. Don’t let this be an emotional decision made from a place of scarcity or fear. How much do you have to invest in your event already (before you get any sponsorships or sell any tickets)? Divide that by the amount you have to invest. Do you know that many people who will pay that much to attend your event so that you will break even? If not, you will want to reconsider either how many people you will have at your event or lower how much you want to raise. If you’re unsure about this, DO NOT PASS GO! Do some more research. Spend some time strengthening your current relationships and leverage those to get new connections (because people automatically like someone that was introduced to them by a trusted friend or colleague, as opposed to a random stranger). If you feel confident that you know enough people to pay the ticket price for you to break even, divide your fundraising goal number by the ticket price you set above. How confident do you feel that you could get that many people to attend? Do you think that you could handle an event for that many people? Remember, be brutally honest with yourself as you answer these questions. It’s better to find out that you need to wait another year to start your signature event, than to force it when you know you shouldn’t and lose a bunch of money. Now that you have a pretty good idea of how your event will work on paper, you’ll want to do some research. 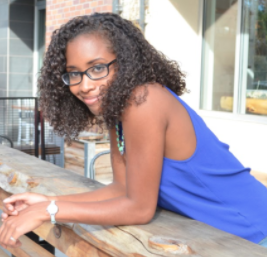 Start off with the Big Three expenses for events: venue, food/drinks, and rentals. Start with venue. What are the options that can host an event for the number of guests you want? Remember to also think about all of the people you’ll need to bring in to help make your event happen on the day in the venue’s capacity. Do the venues you see fit into your budget? If not, it’s time to get creative. Maybe you need to have a smaller event, or find an interesting venue that would be cheaper (I love doing this!). Do you know anyone who might be able to help you find a creative space to host your event? Would an art gallery, restaurant, or even rooftop patio of an office building work for you? Have fun finding out. Do the same for all of the other areas where you might be throwing down a bunch of money. What kind of food or drinks did you want to have? If you have a bar, will it be hosted (you pay for all of the drinks) or not (your guests pay for their own drinks)? Or maybe you have drink tickets for your guests. For rentals, what is included in the venue that you could use? This includes things like tables, chairs, lighting, AV equipment, and even plates and glasses. These things quickly add up so it’s good to have an idea of what you can afford for your event. Design of your marketing materials like sponsorship menus, invitations, website pages, etc. 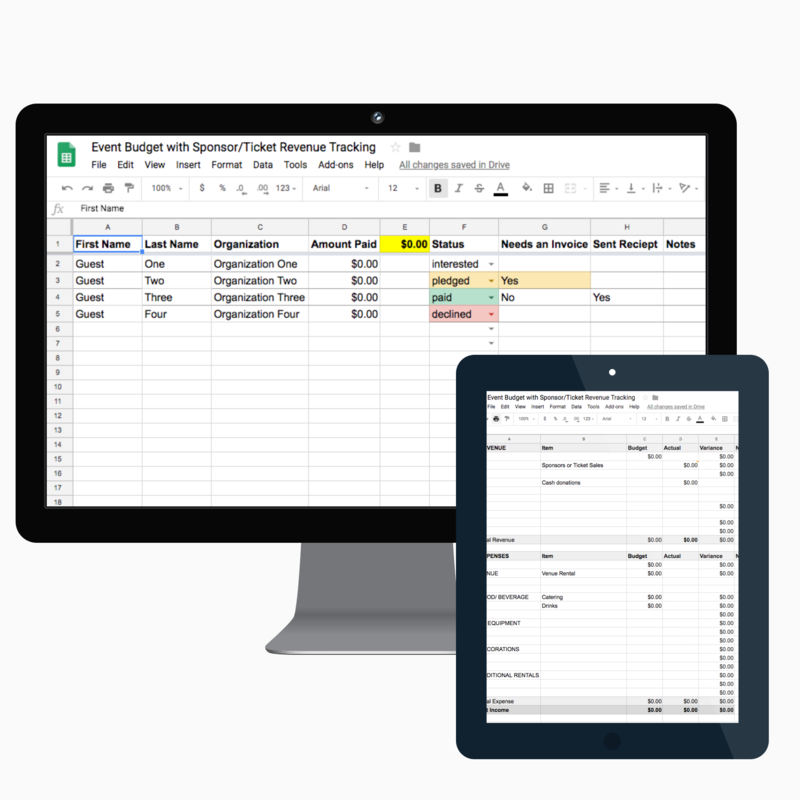 Here’s a budget template to get you started. 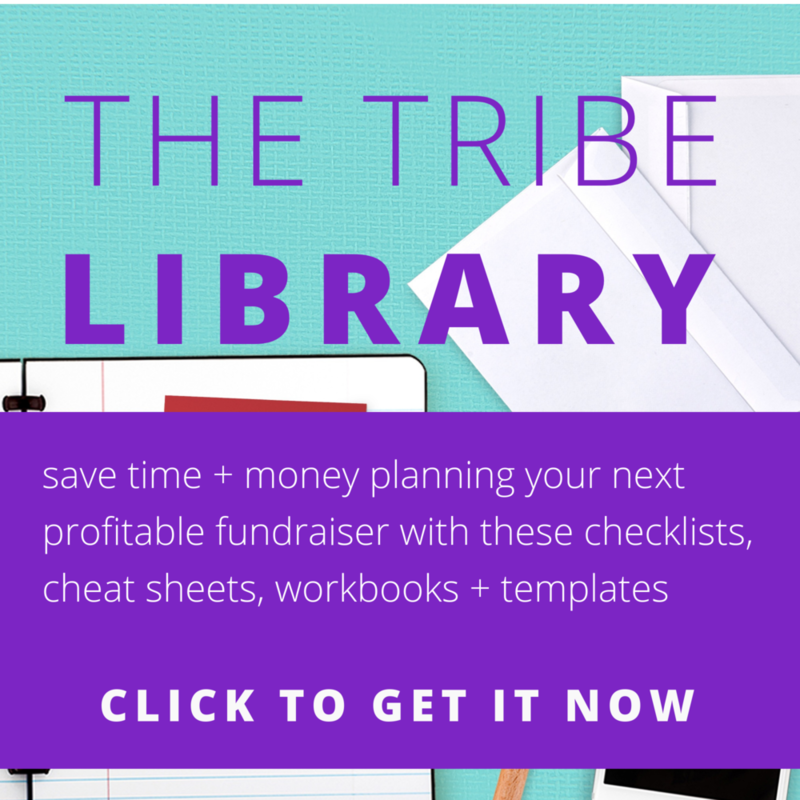 grab this FREE spreadsheet + know exactly where you are with your fundraising profit goals. The biggest thing to remember while you do your research is that your event doesn’t have to be super expensive, but it does need to be a high quality experience for your guests. How can you be creative to get things to fit in your budget AND wow your guests at the same time? Alright, now you’re ready to start making a budget for your event. Remember, your budget is something that will help you while planning your event from beginning to end. Don’t just write some numbers and stick it in a folder somewhere. Use it as a guide regularly and record any time you purchase something. I like to keep all of my receipts together and set aside time to enter them all once a week. This usually takes me less than 30 minutes and I don’t get sidetracked from other work or forget to enter something. Do you have a budget for your event? If so, how has it helped you? Share with the Tribe in the comments below.